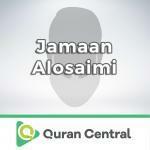 Jamaan Bin Mahmoud Alosaimi is another jewel in the crown of Quran recitation and he is no less than the others. Sheikh Jamaan Alosaimi has been given authentication according to Hafs and Chaoba A’n Assem El Koufi recitation thanks to the able and guidance par excellence of the prolific and noteworthy Shaykh Mahmoud Sakar Aen Muhammad Abdullah Al Iskandarani. His tryst with Imamat came in his first year at college when he was asked to lead prayers in 1986 at Ibn Al Qayyim Al Jauziyah mosque in Al Masyaf, Riyadh. This was a stepping stone for many more future prospects including in Imam Al Daawa Masjid, Riyad Al Salihin mosque and many more. Currently, in the King Fahd’s mosque, Riyadh, Shaykh Jamaan is rendering his services with complete humility and eternal reverence to Islam.